But, did you know that American Adoptions was actually founded with adoptees in mind, too — thanks to our co-founder Scott Mars and his own adoption history? 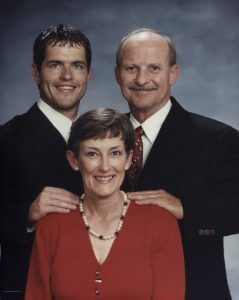 American Adoptions was founded in 1991 by Mars and his parents, Ted and Susan Mars. Scott was only 22 years old and fresh out of college — but he knew that he wanted to use his unique experience as an adoptee to build a better adoption agency and industry as a whole. Mars’ adoption was a private domestic infant adoption; his mother and father had tried to conceive a child for years and suffered several miscarriages before turning to an alternative family-building method. They adopted Scott at 10 days old and raised him in a childhood that Scott is always grateful for. During his childhood, Scott Mars and his parents were a temporary foster home, providing services for more than 140 babies. It was this experience, as well as his own adoption story, that inspired him and his parents to create an agency for guiding other parents through this life-changing process. As the Mars created what would become American Adoptions, they took a few important things into account from their personal adoption journey. As the agency and Scott Mars look back during National Adoption Month, there are a few ways American Adoptions was designed to support adoptees like its co-founder. When Scott was born, it was during a sad age in adoption history. Many birth mothers who placed their children for adoption were forced into closed adoptions against their will, while others simply chose this path because they were unaware other options existed. For Mars, adoption was the same. When he was born, his adoption was closed. He had little information about his birth parents and no opportunity for contact with them as he grew up. “Adoptees always have thoughts around their health history — ‘Where did my green eyes come from? How did I get my brown hair?’ I always wondered when I was little,” Mars remembers. It would take years for Mars to reach out to his birth mother. In fact, he only did so once he considered starting his own family — to know more about the medical history he would pass along to his children. Fortunately, his birth mother was open to the reunion, and the two have created a relationship they continue to keep today. They have taken vacations together, and Mars has even joined her on a large family reunion to meet more of his biological relatives. Today, more than 90 percent of the women who place children for adoption with our agency choose to have an open adoption relationship with their children’s adoptive parents. In order to provide this opportunity to the women who want it most, our agency requires certain openness standards from all adoptive families. Although every open adoption relationship is different, American Adoptions is dedicated to providing as many opportunities as possible to help a prospective birth mother achieve every goal she has for her adoption journey — and to ensure that the children growing up with adoptive families have the opportunities to share contact and develop a relationship with these important people in their adoption story. Scott Mars will be the first to admit that adoption can be a complicated process for all members of the adoption triad. It’s not a decision to be made on a whim, and it’s important that both prospective birth mothers and hopeful adoptive parents receive the support they need. Adoptees have no choice in this unique situation they are born into, and many want to know that their parents made the right decision growing up. That’s why American Adoptions was founded with the promise of support and counseling for both prospective birth mothers and hopeful adoptive parents. For Mars, adoption means joy and beauty — and it can only mean the same for others when they make their decision fully informed, knowing that it’s the best choice for them. Every hopeful adoptive parent and prospective birth mother who contacts our agency is provided free, objective counseling to help them determine whether adoption is the right path for them: whether they are ready for the challenges and rewards of the process, are emotionally secure in their decision, and more. That way, when their children grow up, they can be secure that their parents made an informed and confident decision to place them for adoption or adopt them into their family. If you’ve looked at the American Adoptions website, you’ve probably come across several stories from Scott Mars and Susan Mars about their adoption experiences and their journey to creating our agency. But, in the spirit of this National Adoption Month, American Adoptions has long offered the chance for others to tell their adoption stories, too. Every adoption is different, and you can find many of these experiences detailed in our adoptive family testimonial and birth mother testimonial sections. As our agency’s babies now reach adulthood, we also encourage them to share their stories, as well. We also celebrate the stories of adoptees who haven’t been connected with our agency — such as Jocelyn — to spread awareness about the diversity and beauty of the adoption process. There are many adoption agencies out there, but not all of them have been founded by those so close to the adoption process. For Mars, adoption is more than just his business — it’s his everyday life. By using his unique experience as an adoptee to shape a new kind of adoption agency, he hopes to continue to raise up adoptee voices like his own and change the adoption industry for the better.